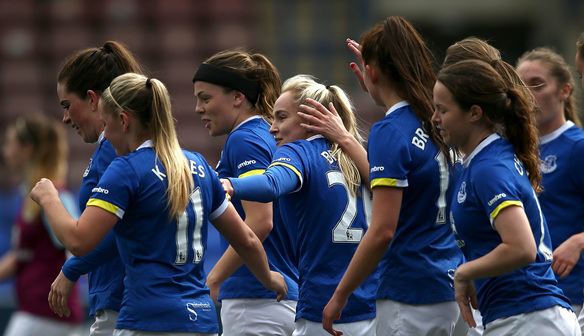 Danielle Turner struck twice as a rampant Everton brushed aside Brighton & Hove Albion with a five-goal display in Widnes. Strikes from Simone Magill and Claudia Walker either side of Turner’s free-kick from 25 yards put the Blues three up before the break. And midfielder Turner added a fourth just after the interval before Georgia Brougham completed the rout. Forward Magill put Everton ahead from the spot inside 15-minutes after Brighton were penalised at a corner. Turner then curled home a stunner of a free kick and five minutes later Walker’s stroked effort inside Brighton stopper Emma Byrne’s right-hand post effectively settled the contest. Visitors Brighton struggled to cope with the Blues’ dominance and, aside from early efforts from Bronwen Thomas and Laura Rafferty, rarely troubled Blues’ stopper Kirstie Levell. And as the minutes ticked down to half-time the Blues went close to extending their lead when Faye Bryson struck Byrne’s right-hand post. Turner made it four on 48-minutes after finding herself with the time and space to slot past Byrne unchallenged. The Blues threatened to heap more misery on Brighton when Gabby George saw an effort brush the top of the crossbar and substitute Lauren Davies stung Byrne’s fingers before Brougham iced the cake. “We’re really pleased. An important one was the clean sheet after conceding three last week. Overall, it was a great performance with four different goalscorers, five goals and three points so we’re really happy. “We were expecting a tough game as we always do in this league, but it was credit to us — we limited them to very little chances. Kirstie (Levell) didn’t have a lot to do. I think it was credit to us and our performance. “I think we controlled the game. “I got two goals and I’m pleased to score because I’ve not scored for quite a while, especially the free-kick — I’ve been practising them quite a bit. “They’re a good side. We didn’t play as well as we would have liked. The first two goals effectively killed the game off, but we kept battling to the end. “The league is really, really tight, but we knew they were a decent side and they performed well on the day so we look forward to playing them again in the next Super League season. “I wasn’t that surprised by Everton’s quality, to be fair. “It was a great free-kick. The only issue might be whether it was a free-kick to start. You can debate that all day long, but the free-kick was a great goal, fair play. Substitutes: Michelle Hinnigan for Claudia Walker 65, Lauren Davies for Olivia Chance 65, Emily Hollinshead for Simone Magill 70. Brighton and Hove Albion (4-3-3): Emma Byrne; Charlotte Young, Vicky Ashton-Jones, Laura Rafferty, Sophie Perry; Kirsty Barton, Hollie Olding, Lucy Somes; Bronwen Thomas, Alessia Russo, Kate Natkiel. Substitutes: Ellie Dorey for Lucy Somes 75. Substitutes not used: Amy Taylor, Leah Samain.